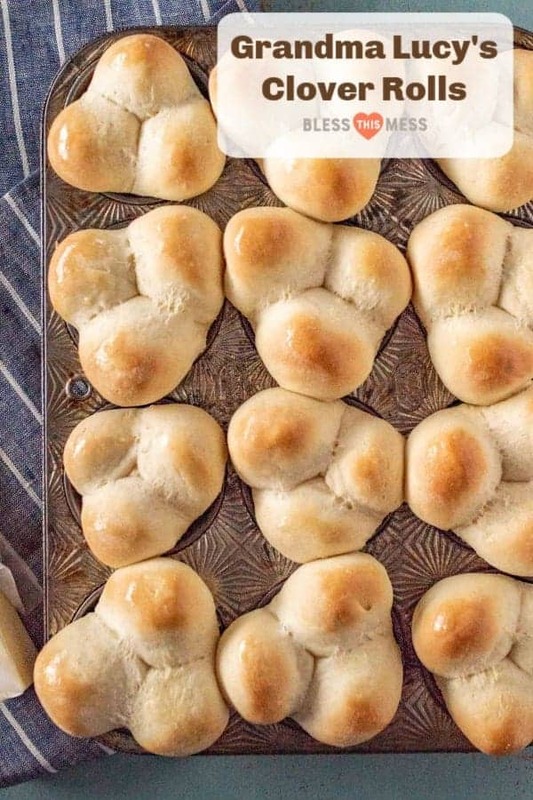 Grandma Lucy’s famous clover rolls that are extra soft and fluffy, easy to shape, and a perfect recipe for little hands to help bake. This recipe comes from my mother-in-law, and it’s a long-time family favorite. She’s been making this recipe for as long as anyone can remember; she said she got the recipe from an older woman at church when she was first married. I’ve changed very little of the recipe that she shared with me because it’s solid (the only thing I changed is using real butter instead of margarine like she does). I love this recipe because it was one of the first yeast bread recipes I made that not only turned out light and fluffy, but also looked great, too! Making clover rolls is pretty fool-proof, thanks to the help of a muffin tin. All you have to do is divide the dough up evenly, and roll it into balls. The shaping is so simple that this is a great recipes for kids to help make. Plus, you don’t need a stand mixer to make the dough, which makes this a really accessible roll recipe. 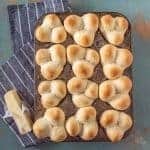 I serve these rolls often during the week and scale the recipe up to make larger batches for family gatherings during the holidays. 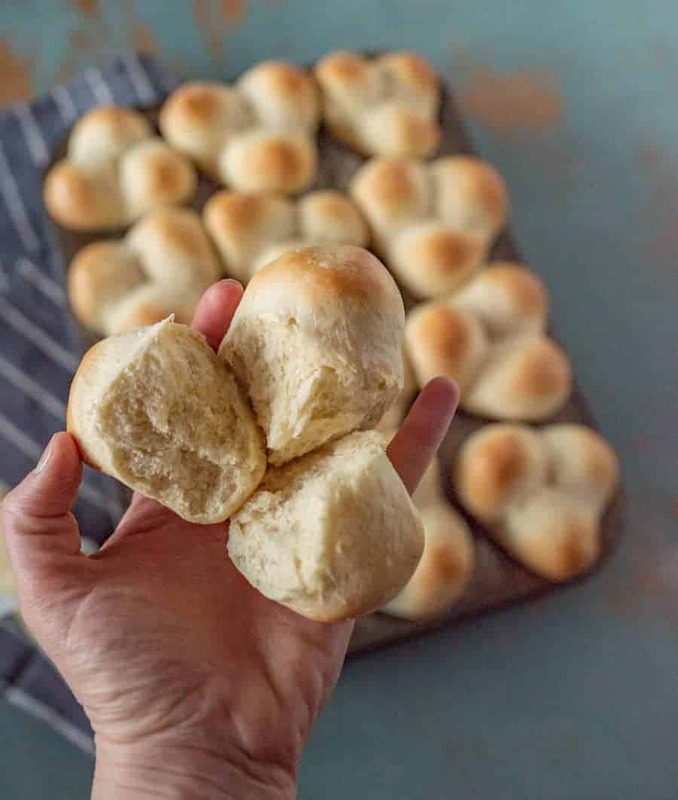 I love that the recipe only makes a dozen rolls, which is just the right amount for a weekday meal without too much fuss. What should you do if your dough isn’t rising? If your dough doesn’t rise, it could mean the room is too cold, you didn’t knead the dough enough, or your yeast is dead. Sometimes, using the wrong type of flour can also cause dough to not rise, but I’ve actually had pretty good luck using half all-purpose flour and half whole-grain in this recipe! This recipe is pretty simple, so if you’re experiencing issues with the dough rising, try troubleshooting it by kneading the dough more, checking the yeast’s package, or making the room warmer. What if the dough is too sticky, or the dough is too dry? Perfect dough is one of the most difficult parts of baking bread, but don’t let that discourage you! If your dough is too sticky, generally that means not enough flour has been used. Similarly, if it’s too dry, that usually means there’s too much flour. To avoid over- or under-flouring your dough, be sure to add flour to the mixture one cup at a time until it reaches an ideal, stretchy consistency. 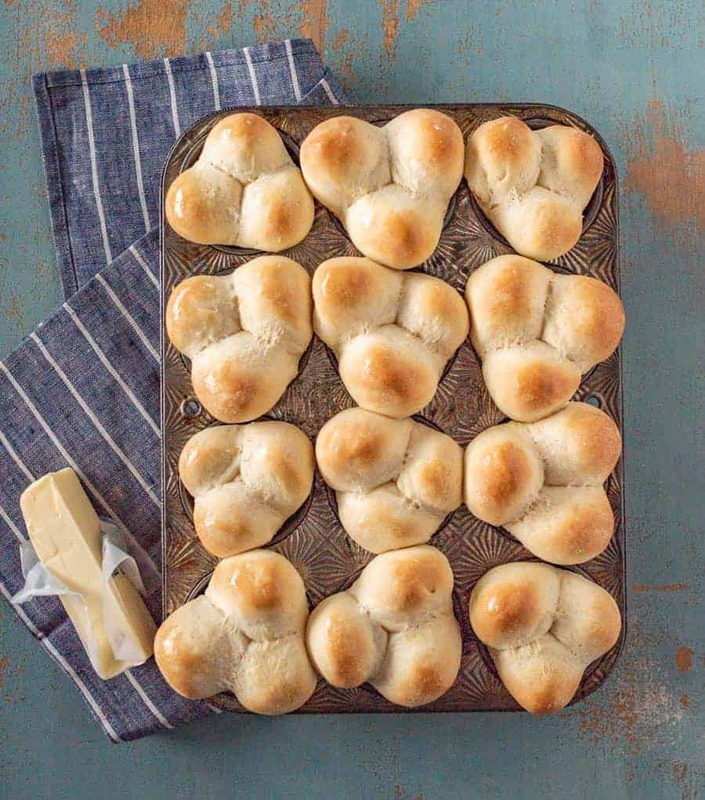 How do you keep clover rolls fresh for the next day? If your rolls stick around for a day or two, more power to you! Store them at room temperature in a breadbox or paper bag to cut down on moisture loss. These storage options also allow the outsides to remain pretty firm–there’s nothing worse than a soggy roll! In a medium sauce pan, combine the milk, butter, sugar, and salt. Stir to combine. Heat over medium heat, just until the butter melts. Set aside. In a large mixing bowl, add the warm water and yeast. Let the mixture rest for 5 minutes. When the milk has cooled to less than 110 degrees F, add it to the water and yeast mixture. Stir to combine. Add the flour, one cup at a time, stirring well to combine after each addition, until no longer sticky. Turn the dough onto a well-floured surface, and knead until smooth and elastic, about 6 minutes. Place the dough back in the bowl, cover, and let rise for 30 minutes. After 30 minutes, preheat the oven to 350 degrees F.
Grease a 12-cup muffin tin well. Remove the dough from the bowl, and cut it into 12 pieces. Divide each of the 12 pieces into 3 smaller pieces. Roll the smaller pieces of dough into balls, and place three small pieces of dough into each muffin cup. Bake for 15 minutes or until the rolls are golden-brown on the top. Remove tin from the oven, and rub the tops of the hot rolls with a stick of butter. Let the rolls rest in the tin for 10 minutes, and then remove the rolls from the muffin tin. Place them on a wire rack to cool. Margarine can be substituted for the butter in this recipe. I have had great luck using half all-purpose and half whole-wheat flour in this recipe. I’m so excited to have this “heritage recipe” on my site now. You know the ones my kids are going to ask me about because they remember their grandma making. Isn’t food special like that!